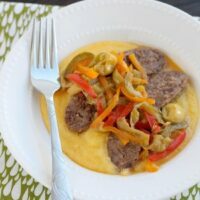 Italian Sausages with Peppers and Grapes - Dessert Now, Dinner Later! 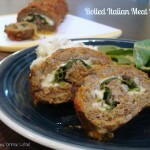 I’ve got another Italian dish for you today! This time it’s dinner and it’s gluten free served on a bed of polenta. This recipe makes A LOT, so make sure you have a big family, hungry teenagers, or guests over for dinner. 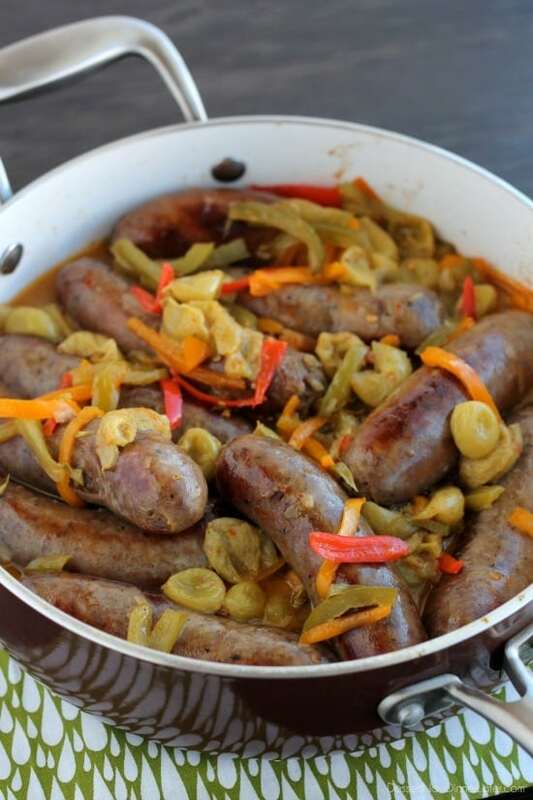 These Italian Sausages with Peppers and Grapes are slowly cooked so the grapes burst and make a glaze with the sausages’ juices. 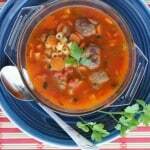 It’s a traditional Umbrian dish from Central Italy according to Lidia Bastianich, with exception of the peppers. I added those for some color and heartiness. It was almost killer waiting for this dish to be done. It takes a good 45 minutes to make this meal and it smells SO GOOD as the flavors are marrying together. Be sure to have a big pot or skillet on hand. I actually used a stock pot and then transferred the food to a skillet, to make sure everything had room to cook right. Can you see that orange-ish sauce in the skillet? Absolutely delicious! This is totally different than anything we have had before, but in a good way. I will definitely have to half the recipe for our little family next time, but the lightly spicy sausages with the sweet, yet tart grapes and tender peppers are so delicious! Try it! 8 large garlic cloves, © DESSERT NOW DINNER LATER All images & content are copyright protected. Please do not use my images without prior permission. 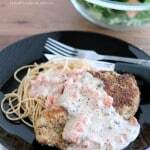 If you want to republish this recipe, please re-create the recipe, snap YOUR OWN PHOTO and re-write the recipe in YOUR OWN WORDS, or link back to this post for the recipe. In a large (12-inch) skillet or stock pot, heat the olive oil over low heat. Add the garlic cloves, and when they begin to sizzle, add the sausages in one layer. Cover the pan and cook gently, turning the sausages and moving them around the skillet occasionally as they begin to brown and release some fat. After 10 minutes, add the chili flakes and continue cooking for an additional 10 minutes until the sausages are golden all over. Tilt the pan and remove all but a few tablespoons of the fat. 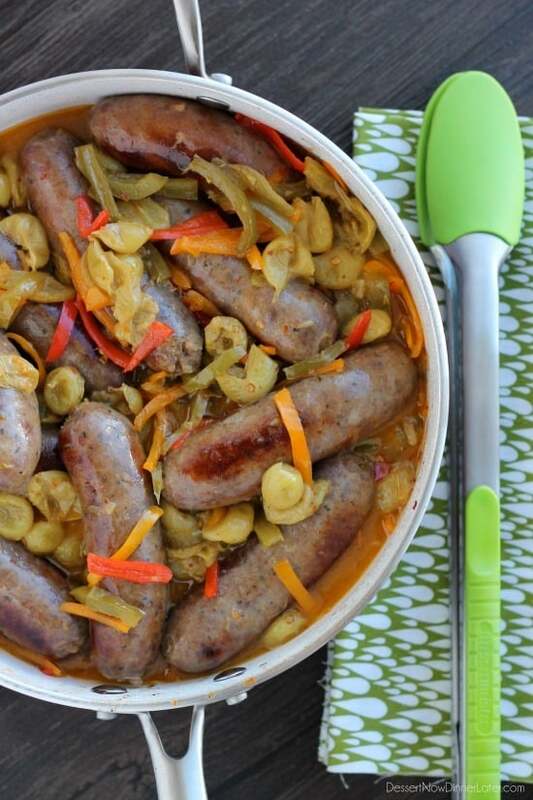 Discard the garlic cloves and move the sausages to another skillet; cover and keep the sausages warm on low heat. Add the grapes to the skillet the sausages were browned in, stirring to coat them well with the pan juices. Cover and cook until the grapes soften and release their juices, 7 to 10 mintues. Add peppers and cook until tender, about 5 minutes. Add hot sausages back to the pan and stir everything well with the grape and pepper glaze/sauce; simmer for 5 more minutes. Serve sausages cut in half on a bed of polenta (instructions to follow) with the grapes and pepper mixture scattered over them and the pan juices drizzled over the top. For the polenta: Bring water to a boil in a large saucepan. Add salt. Gradually whisk in the cornmeal. Reduce the heat to low and cook until the mixture thickens and the cornmeal is tender, stirring often, about 15 minutes. (Mine actually thickened right away, so I let it sit for 10 minutes off heat to continue softening.) Add butter, stir until melted and serve. This looks so yummy. And I love the colors! 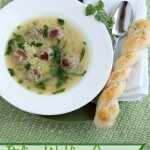 I am so happy to come across this recipe. 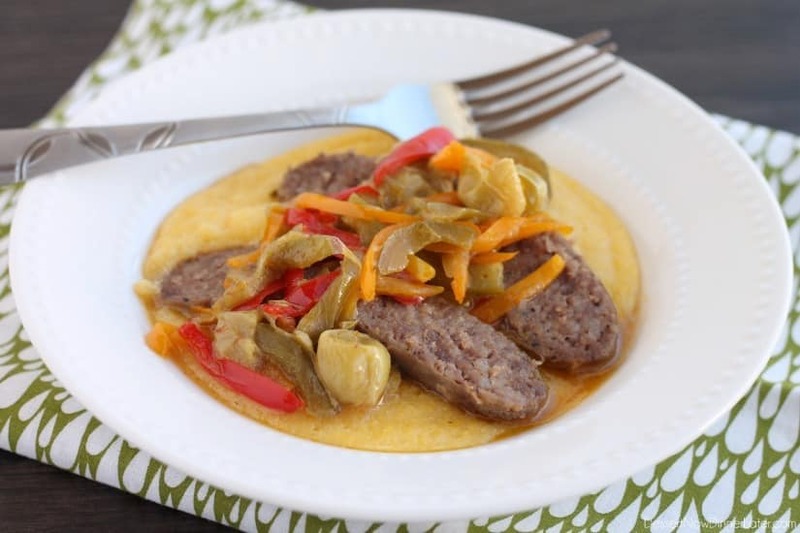 I was going to make sausage/pepper/onions on hoagies for my mom’s birthday dinner –and she’s Italian– but making it with polenta instead would be wonderful! Do you know how well this will keep overnight if I make it a day in advance? It does okay, but the sausages will be a little drier and the peppers will be soggy. We were eating leftovers for a couple days. Fresh is best. I hope you love it! 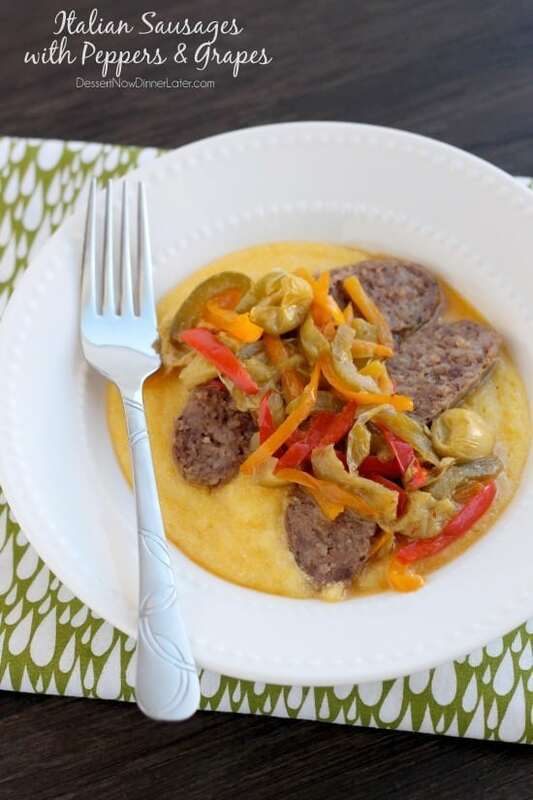 Just wanted to let you know that my family LOVED the sausage & peppers with grapes & polenta. Everyone wondered what the grapes were until they tried them. I also made the coconut poke cake for dessert and they loved that as well…we ate the whole cake, which is rare. I’m going to make the coconut blueberry muffins with the leftover coconut. Oh that’s so great that they loved it (and the cake)! Thanks for coming back to leave your review, and I hope you love the muffins as well!